Syllabus of the Online Course (Subject): African Multimodal Northern Corridor (Burundi, Rwanda, Kenya, and Uganda). Learning materials in or Corridor Nord Corredor Norte Corredor Norte. Description of the Online Course - African Multimodal Northern Corridor. The African Northern Corridor is a logistics project formed by three landlocked countries (Burundi, Rwanda, and Uganda) and Kenya. 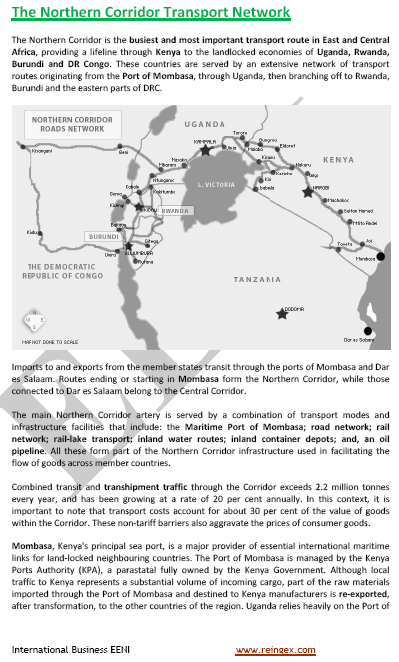 This African multimodal logistics corridor (waterway + Rail + road + Maritime Port of Mombasa) also links with the Democratic Republic of the Congo (Kisangani), South Sudan (Juba), and Tanzania. The main objective of the African Northern Corridor is to encourage and facilitate regional trade between member countries. The Northern Corridor Transit and Transport Co-ordination Authority coordinates the project and the implementation of the agreement. The African Multimodal Northern Corridor belongs to African Civilisation.